In Maria’s paintings, she renders in colour the stories of the physical and emotional landscapes that formed her experience of being born in Greece and then growing up in England and Cyprus. The actual process of her painting relates to this theme, as she uses mixed media, building up and scraping back areas of paint to capture the atmosphere, mass, and light of the landscapes she is trying to represent. 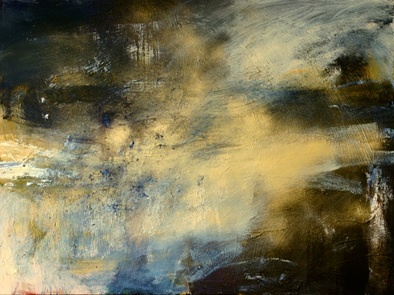 In her series ‘The Gloaming,’ she explored ways of bringing these landscapes together and play with the similarities and contrasts: How being caught between two time perspectives – the Eastern Mediterranean is two hours ahead of England – two different kinds of light, two different cultures, results in both a feeling of richness and diversity of experience as well as a search for rootedness in the moment and in space. Dusk and the changes in light between sunset and darkness, capture this feeling of ‘homelessness’ and search for ‘home.’ On the other hand, in the plays of light, in exploring ways of translating experiences and representing them in paint on the canvas, there is a liberating beauty too. In her ‘Ithaca’ series, inspired by the Greek Poet Konstantinos Kavafis’ poem ‘Ithaca,’ she follows the theme further exploring different possibilities of rootedness/rootlessness and the riches of the search for home. 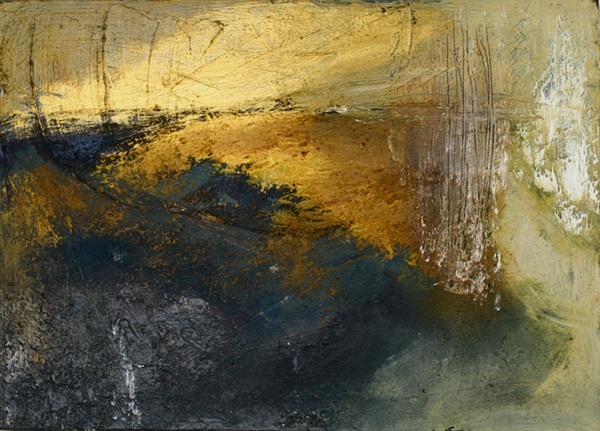 Her later series, ‘Time and Tide’ takes the theme further to a broader exploration of the temporal nature of human experience and its relationship with nature and the recent addition of gold leaf and metal in her work is inspired by some time spent in Venice, visiting the Biennale and Greek iconography.